Arlington, Va. - August 21, 2012 - PBS Distribution today announced it is releasing "American Masters: The Day Carl Sandburg Died on DVD. For much of the 20th century, Carl Sandburg (1/6/1878 - 7/22/1967) was synonymous with the American experience, a spokesman on behalf of "the people." One of the most successful writers in the English language, Sandburg was a three-time Pulitzer Prize-winner for his poetry (Cornhuskers, 1918 and Complete Poems, 1950) and part of his six-volume Lincoln biography (Abraham Lincoln: The War Years, 1939). He was also a groundbreaking journalist, folk song collector, children's storyteller, political organizer/activist, novelist, autobiographer, and captivating performer. Yet, after his death, Sandburg's literary legacy faded and his poems, once taught in schools across America, were dismissed under the weight of massive critical attack. This new documentary, commemorating the 45th anniversary of his death, provides a dynamic examination of Sandburg's life, work and controversial legacy from a modern perspective. 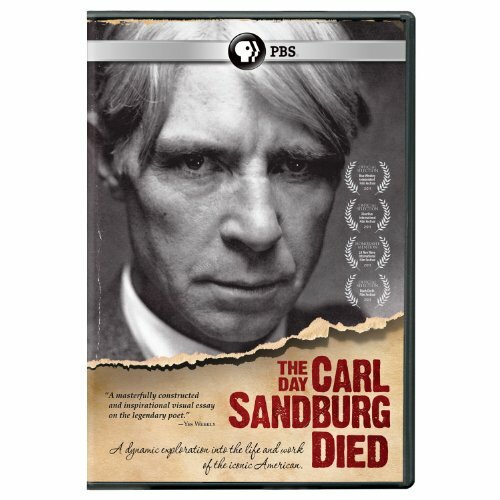 American Masters: The Day Carl Sandburg Died will be available on DVD September 25, 2012. The program has a run time of 84 minutes. The SRP for the DVD is $24.99. Filmmaker Paul Bonesteel exposes Sandburg's radical politics and anarchist writing during World War I as well as the current burgeoning resurgence of interest in him and his contributions. Drawing on archival footage and photographs, American Masters: The Day Carl Sandburg Died features spoken word performances, songbook selections, readings, and original interviews. Sandburg's daughter Helga Sandburg Crile, his grandson John Carl Steichen, Pete Seeger, the late Studs Terkel and Norman Corwin, poets including Ted Kooser, Marc Kelly Smith and Yevgeny Yevtushenko, Grammy-winning musician Dan Zanes, Sandburg biographer Penelope Niven, and notable scholars share stories about Sandburg and reflect on the modern relevance of his vast body of work, including Chicago Poems (1916), The American Songbag (1927), and The People, Yes (1936). Self-proclaimed "The Eternal Hobo," Sandburg used his unique life as the basis for his radical free-verse poetry: from impoverished beginnings on the Illinois prairie to the halls of Congress to The Ed Sullivan Show. Entertaining audiences on stage, radio and television with his performances, Sandburg enjoyed the kind of fame, fortune and recognition that is rarely, if ever, afforded a poet. "Sandburg was both a deeply patriotic American and an anarchist. Labor unrest, global wars, socialism, immigration, and race issues were all subjects that fueled him. Much of his writing is as relevant and provocative today as it was when it was first published and shocked the world," observes Bonesteel, whose films for public television include The Great American Quilt Revival (2005) and The Mystery of George Masa (2003). "Carl Sandburg was one of the three American poets we knew and loved when I was in high school. I am so delighted he is being discovered by a new generation today- what a shame to miss out on this man's elegant words!" says Susan Lacy, American Masters creator and executive producer. Special features on this DVD include: Penelope Niven comments on Sandburg's dynamic life; Marc Smith's performance of Sandburg's poem "Prairie;" Pete Seeger talks about The People, Yes; and an interview with the filmmaker, Paul Bonesteel. Since its 1986 premiere, American Masters has earned 23 Emmy Awards - including Outstanding Non-Fiction Series eight times since 1999 - the 2012 Producers Guild Award, 12 Peabodys, an Oscar and three Grammys. Now in its 26th season on PBS, the series is a production of THIRTEEN for WNET, the parent company of THIRTEEN and WLIW21, New York's public television stations, and operator of NJTV. For 50 years, THIRTEEN has been making the most of the rich resources and passionate people of New York and the world, reaching millions of people with on-air and online programming that celebrates arts and culture, offers insightful commentary on the news of the day, explores the worlds of science and nature, and invites students of all ages to have fun while learning. American Masters: The Day Carl Sandburg Died is a production of Bonesteel Films in association with THIRTEEN's American Masters for WNET. Paul Bonesteel is writer, director and editor. Matthew Gellert is producer. Davis Bates is narrator. Music is by Zoe Keating. Susan Lacy is the series creator and executive producer of American Masters. American Masters is made possible by the support of the National Endowment for the Arts and by the Corporation for Public Broadcasting. Additional funding for American Masters is provided by Rosalind P. Walter, The Blanche & Irving Laurie Foundation, Rolf and Elizabeth Rosenthal, Cheryl and Philip Milstein Family, Jack Rudin, Vital Projects Fund, The Andre and Elizabeth Kertesz Foundation, Michael & Helen Schaffer Foundation, and public television viewers. Additional funding for The Day Carl Sandburg Died is provided by the Illinois Humanities Council, Nebraska Humanities Council, and North Carolina Humanities Council. In 2012, WNET is celebrating the 50th Anniversary of THIRTEEN, New York's flagship public media provider. As the parent company of THIRTEEN and WLIW21 and operator of NJTV, WNET brings quality arts, education and public affairs programming to over 5 million viewers each week. WNET produces and presents such acclaimed PBS series as Nature, Great Performances, American Masters, Need to Know, Charlie Rose and a range of documentaries, children's programs, and local news and cultural offerings available on air and online. Pioneers in educational programming, WNET has created such groundbreaking series as Get the Math, Oh Noah! and Cyberchase and provides tools for educators that bring compelling content to life in the classroom and at home. WNET highlights the tri-state's unique culture and diverse communities through NYC-ARTS, Reel 13, NJ Today and the new online newsmagazine MetroFocus.